Living Life - one scrap at a time ! 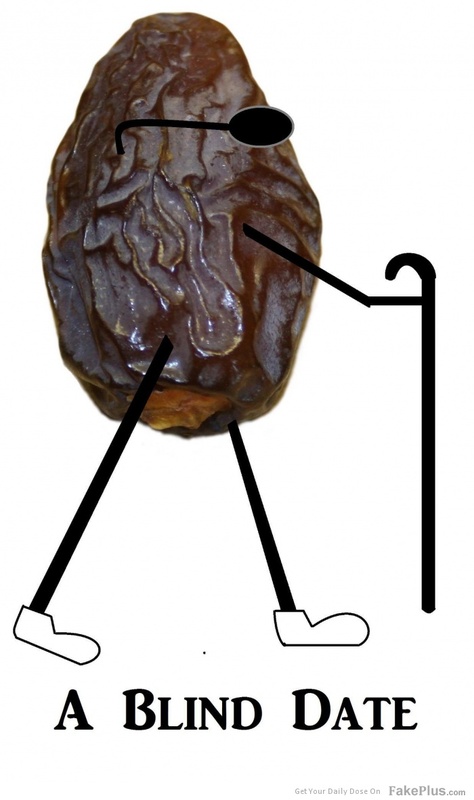 I am so excited to be finally introducing the BLIND DATE @ 'The Square Inch' ! An idea that has been long brewing at the back of my head. 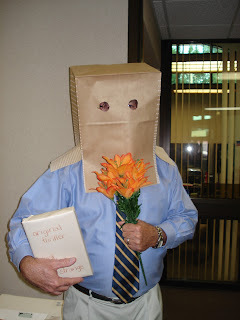 Oops...not this sort either ! 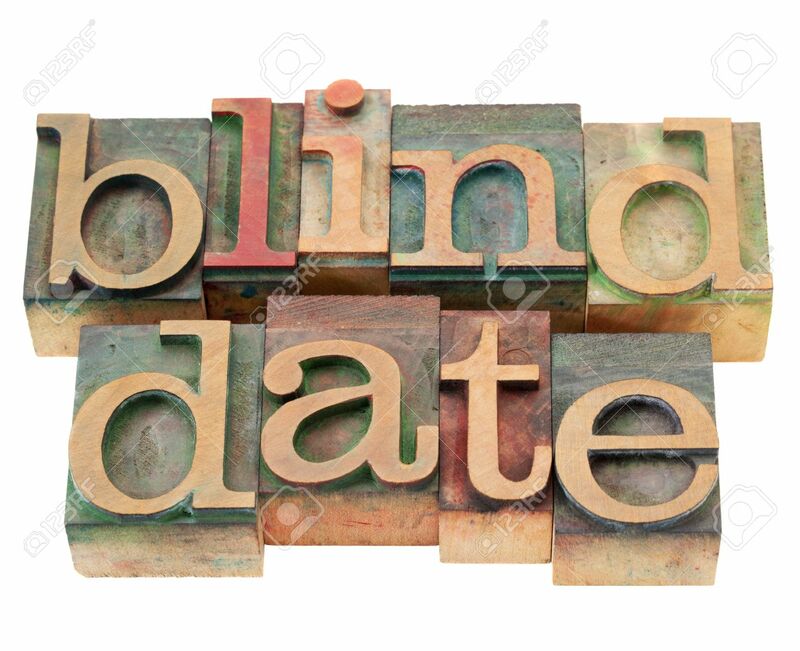 A blind date with other sewing enthusiasts over some fun learning and a pot luck . Now is that interesting or what?! So who's ready for BLIND DATE FRIDAY this October 9th at The Square Inch with fellow sewists? Admission fee - Rs.500 plus one pot luck dish for lunch. You get to learn a surprise fun technique and play on the BERNINAs. Time - 1030 to 1500 hrs. List of items to be carried will be mailed to confirmed participants. To register, write to the.square.inch@gmail.com. I can promise you one hell of a day ! Until then, stay awesome ! You deserve to Dye ! We at The Square Inch, are getting ready to host a Batik workshop over the next two days. 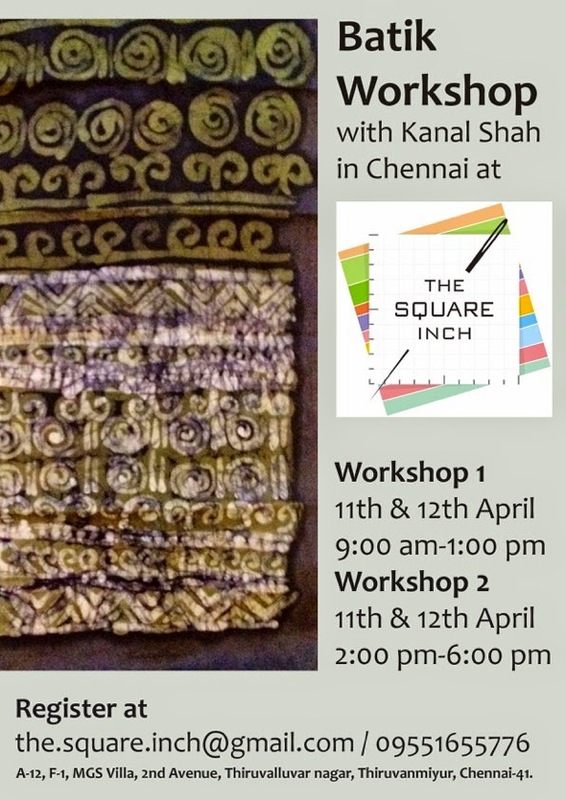 The instructor is the awesome Batik Artist, Kanal Shah of 'Creative Batik & Indian Textiles'. Kanal Shah is architect and designer from Baroda, India, living and working in Switzerland. Having learnt the art of Batik early on from her mother she has been creating different works in batik art in Switzerland since 2004, combining the traditional art with contemporary patterns and proportions. She has since then hosted and participated in different exhibitions displaying and teaching her work. Batik is both an art and a craft, which is gaining popularity in recent times as a wonderfully creative medium. 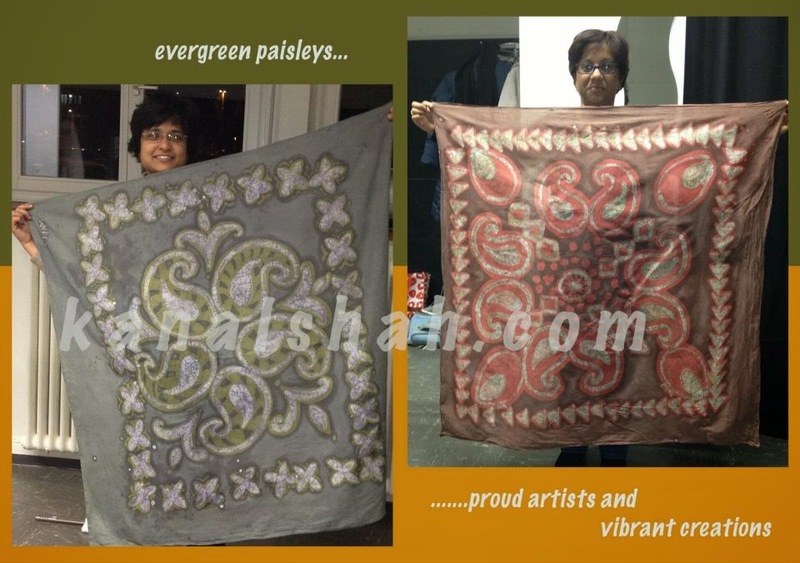 The art of decorating cloth in this way, using wax and dye, has been practised for centuries. The upcoming two day workshop comprises of painting through handling of wax using different techniques and colouring with dyes. Each participant gets to create his/her own piece of batik as a take away. The workshop fee is inclusive of all material. Just come in with a creative mood and unleash your artistic instinct through medium of wax. You can take a look at some of Kanal's work here too... http://www.kanalshah.com/exhibitions/exhibition_2005.html . If you'd like to register, we still have a spot that's just opened up. Do call Tina on +919551655776 or write to the.square.inch@gmail.com. Orey kallu le erandu maanga! I know this will bring a wistful smile to Tamil speaking readers as they fondly remember their childhood summers spent pelting stones at unripe mangoes on the neighbours' trees in an effort to knock them down for a bitter-sour-sweet treat with equally mischevious friends ! The line when transliterated means knocking down 2 mangoes with 1 stone, meaning getting two jobs done with the effort of one. Which is exactly what I have done with this block. 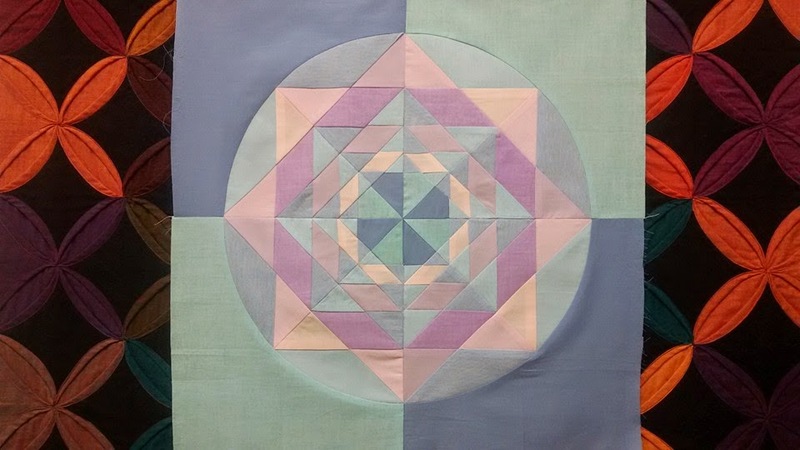 This is a block, the Fractal Mandala, I tested for the insanely beautiful MMDQ BOM (Madhu Mathur-Desi Quilters Block of the month) series, designed by the beautifully insane Madhu, a dear friend and quilter par excellence. You can find complete instructions to the other blocks here. 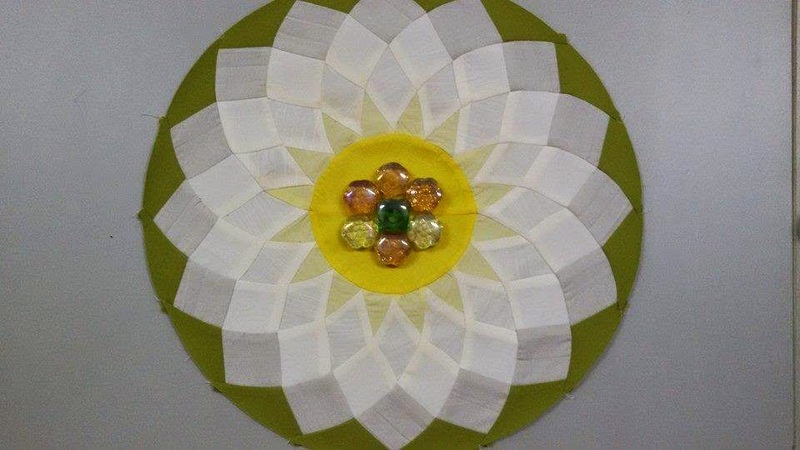 It involved a lot of paper piecing, like all the other blocks in the series, but the end result is striking. I chose a soft palette as these are not my usual colours and I did want to do something different. 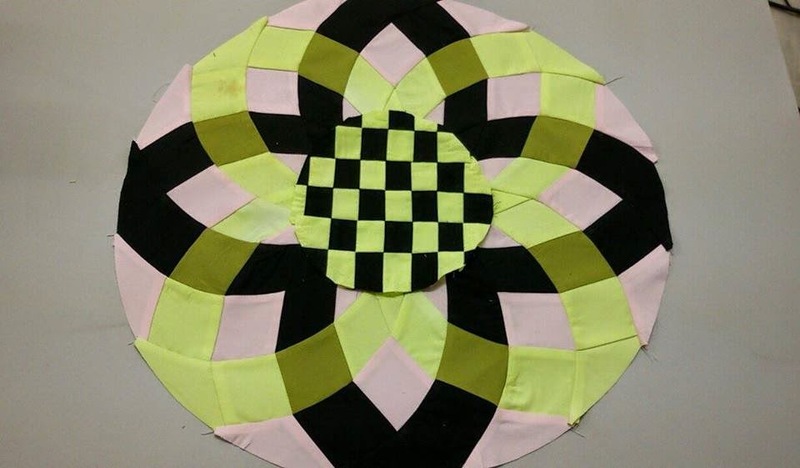 It so happens that we are having a medallion quilt swap on my FB group 'Desi Quilters ' and this block would be perfect to pass off as a medallion center with a 4 sided border ! So there, 2 mangoes with 1 stone, see ?! And these are the 2 other MMDQ blocks I have made so far..the gorgeous Dahlia and its ribbon version..
Bernina Brand Ambassador ! Yes, lucky me ! 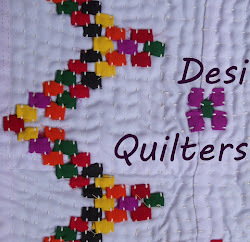 I also get the opportunity to write about my sewing and quilting experiences on the Bernina Corporate blog at http://blog.bernina.com/en/. How awesome is that ?! In my younger days, I thought I could be a model. But my body rebelled and wouldn't budge beyond 'petite' at 5 feet nothing ! So my runway dreams had to run away. I did consider toothpaste ads, heh heh, but didn't really pursue. The Universe now gives me a second chance. Or is it the first? I am now a model, of sorts, putting it loosely, for no less than a World Leading brand, the awesome Bernina ! Ha, body, take that !! The writing will put me on an international platform and get me one step closer to the book I've been thinking/dreaming of writing I guess. 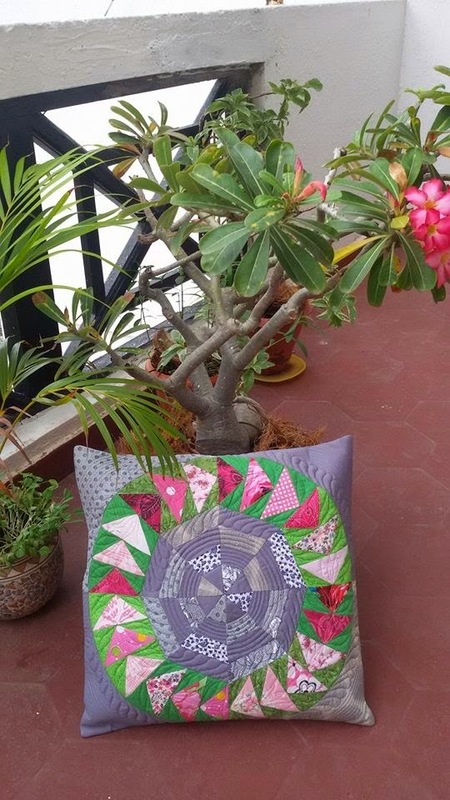 Speaking of which, remember the Warli quilt I presented to the Bernina owner and chairman, Mr.Ueltschi during his visit to India? I did a small tute which got published in two prestigious publications ! Might as well do all the gloating in one post, so here are the pics..
Well, my day is made ! Hope yours will be too. Happy doing-whatever-its-you're-doing ! 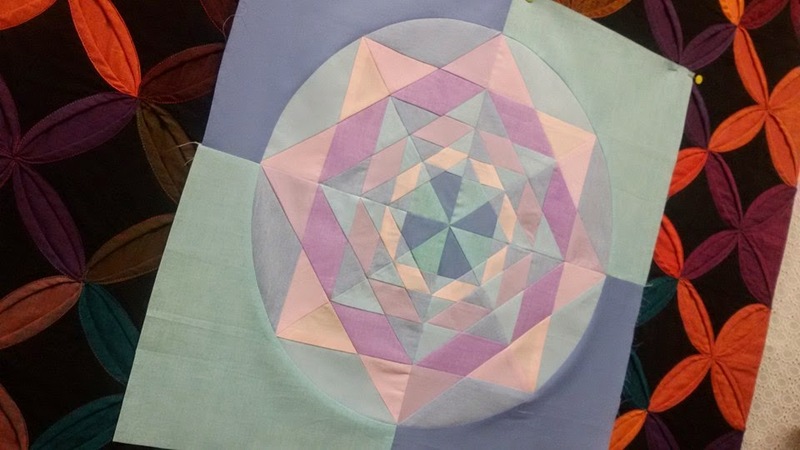 Finished quilting this beauty for a client. I can't believe this is her first quilt. The stitching is so neat and the blocks, perfect. 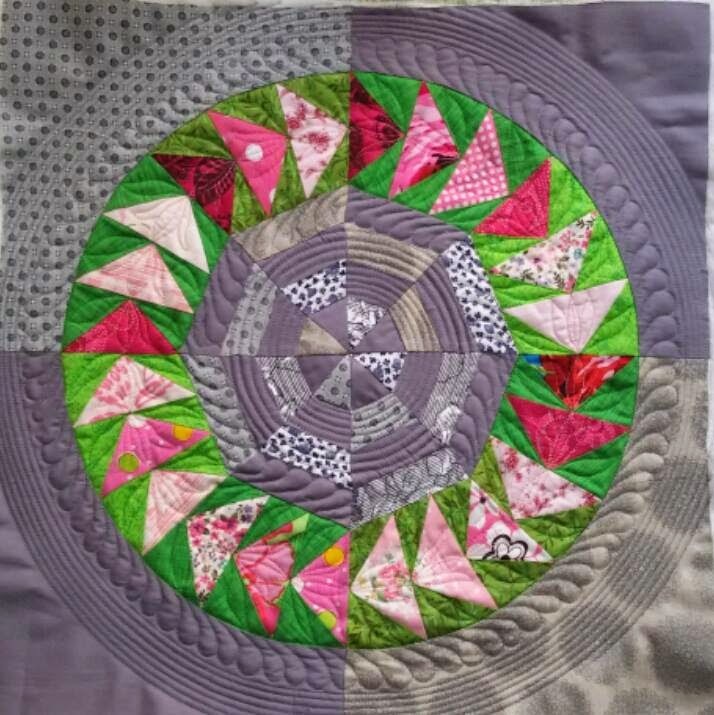 Did lots of free motion quilting on this one after some SID around the green 'paths'; lotus buds in each of the four corners inside the squares and stippling all around them. I used the BSR, the patented Bernina Stitch Regulator, and it made the FMQ-ing so so so smooth. I must've saved boatloads in terms of effort and energy expended! And no shoulder pain ! I don't think I ever, EVER want to do FMQ without the BSR. Ever ! Finished the border with multiple wavy lines, done with a walking foot. 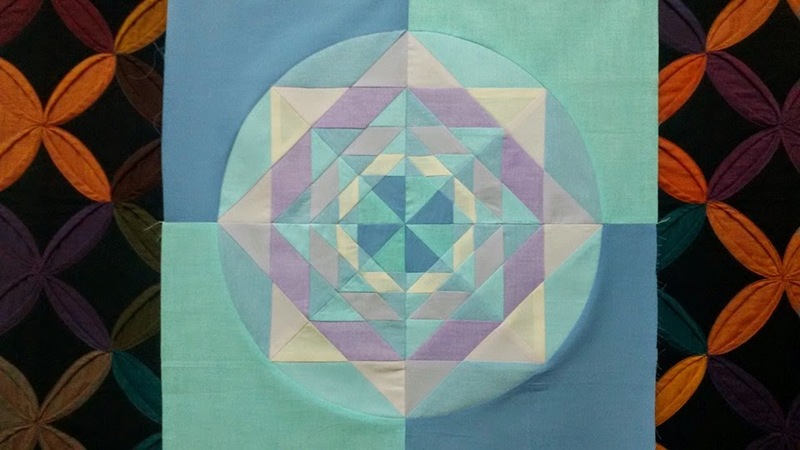 Happy quilting ! Or whatevering ! 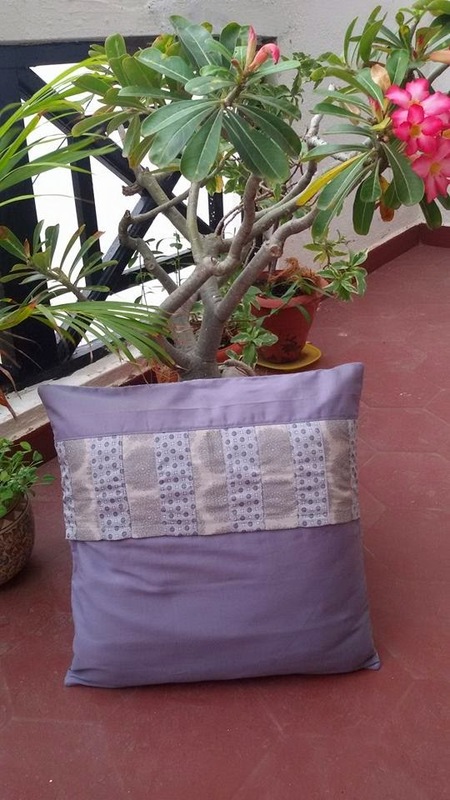 We are happy to announce a short and sweet guest workshop on making a cute little fabric basket, by the beautiful Ms.Vatsala Kamat of Bangalore on the 7th of November, 2014 at The square Inch. Limited seats, so please contact us if you'd like to register yourselves for the event. Soon after the workshop, we'll have a trunk show over tea, where we'll get a chance to ogle at her lovely bags and admire her impeccable craftsmanship. So, see you on Friday ! No quilty post today. Just wanted to wish myself a happy birthday before I sit down with a nice glass of Christmas wine (What? Its not Christmas yet?!) and watch 'House' on TV. I kinda like him :-).